$1,999,000 THE DEROW HOUSE, 1975. ARCHITECT VUKO TASHKOVICH. A sensation of calm immediately envelops you upon entering this private, modern property. A Tashkovich masterpiece, respected, preserved, enjoyed! Tashkovich’s modern houses, subject of a retrospective at Cornell’s Herbert F. Johnson Museum of Art, are considered masterpieces of contemporary architecture, featuring strong lines, striking shapes, and large glass walls. 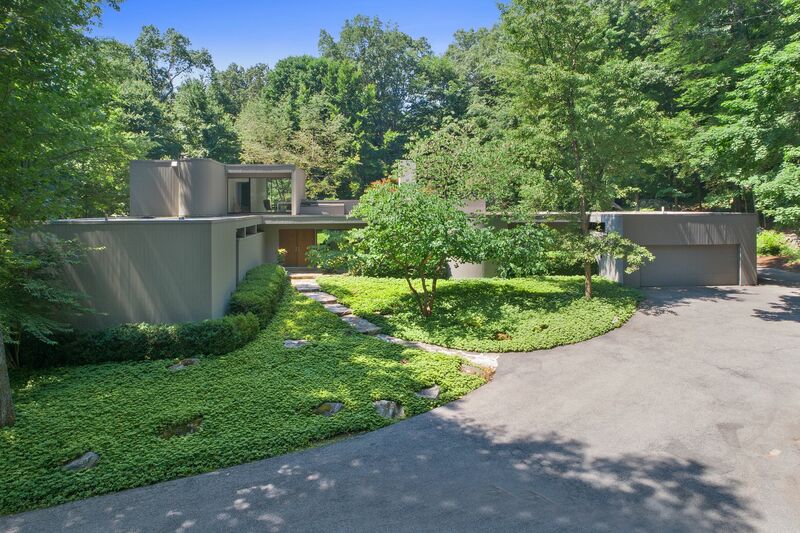 The Derow House is one of 57 designed by the architect and is beautifully sited on 2.75 private acres of breathtaking grounds up a meandering drive; Tashkovich was also known for his extraordinary sensitivity to placement of his homes to take advantage of an area’s natural beauty. Indeed, this homes social spaces, including an inviting step-down living room overlooks manicured grounds through floor to ceiling walls of glass. Tashkovich’s semicircular glass dining nook in the kitchen, and the dramatic contrast of two ceiling heights in the living room are just two of many signature elements found inside. The modernized kitchen is wonderful for entertaining, a gathering place for family and friends and flows beautifully into social rooms too for more formal occasions. A sleeping upper level master suite is brilliant in placement, positioned for privacy, though convenient to the family-guest wing with 3 bedrooms, den and two private baths. For outdoor fun in the sun enjoy park-like grounds leading to a Har-Tru tennis court for the enthusiast. Secluded, yet minutes away from Metro North, shopping and restaurants. BY THE NUMBERS: built 1975, 4 bedrooms, 3 bathrooms, den/study, finished basement, 2.75 acres with room for pool, Har-Tru tennis court, 3,777 square feet, 2 car attached garage, 2 sided open fireplace: LIVE THE GOOD LIFE.